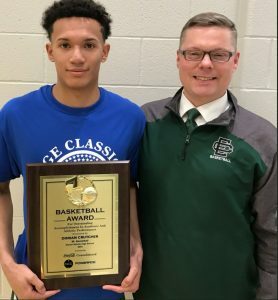 Dorian Crutcher was named 2018 Mr. Basketball in Lorain County last evening at the Lorain County Legeza Cage Classic at North Ridgeville. Crutcher is the first Panther to earn this honor since 1990. Former Panther Basketball standout Eric Barnes was named Mr. Basketball at the conclusion of the 1989-90 season. In the Cage Classic, Crutcher also earned game MVP honors, finishing with 21 points. The following is courtesy of Mike Perry, The Chronicle-Telegram. Published on March 26, 2018 | Updated 7:29 a. m.
NORTH RIDGEVILLE — For a parent, it’s natural to want more for your kids than you had yourself. On the basketball court, former Elyria West standout Nate Crutcher got exactly what he had hoped for when his son, Dorian, was named 2018 Lorain County Mr. Basketball on Sunday night during the Lorain County senior all-star showcase at North Ridgeville High School. “This means a lot, especially for my family,” Dorian said of winning the award that goes to the top senior basketball player in the county. “My dad really wanted me to win this award the past four years and that’s what I have really been working for. Every day he pushed me and asked me if I wanted it. That entailed a lot of basketball. Nate Crutcher said his son would shoot jump shots for “hours and hours” during their workouts prior to his senior season. 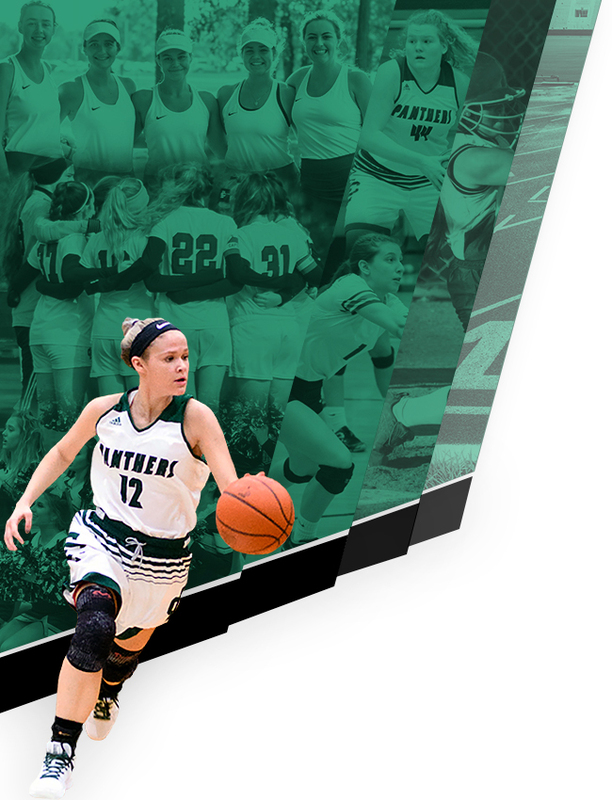 Dorian broke the career scoring record at Elyria Catholic with 1,287 points, surpassing the previous record of 1,220 set by Bobby Holiday. Eric Barnes, the last Panther to win Mr. Basketball (1990) is third on the career scoring list with 1,191 points. Crutcher also set EC’s single-season mark for 3-pointers this year with 82 while averaging a career-high 24.3 points per game. The elder Crutcher was a high-flying wing for the Wolverines in the early 1990s. 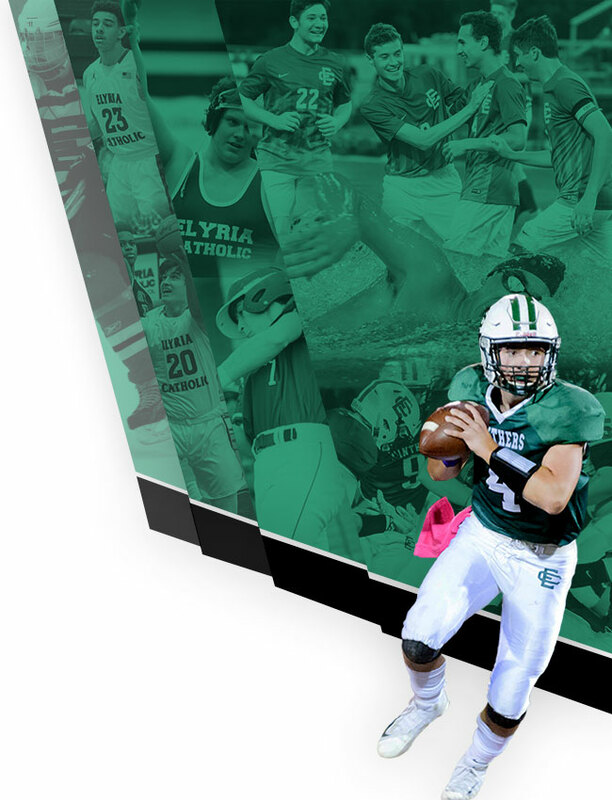 Elyria Catholic coach Phil Kuchta said the relationship between the Crutchers is special. “As parents, we do put pressure on our kids to be successful in everything they may be involved in, but Nate is a great guy, he was a great player and he always wanted the best for his son,” Kuchta said. “He told me four years ago that Dorian wanted to be the best player that I’ve ever had. Nate Crutcher is proud of what his son was able to accomplish. Dorian is also an honor roll student at Elyria Catholic with a grade-point average over 4.0 this year. The younger Crutcher said he put a lot of effort into his grades as well as basketball. He was also pleased to be able to bring the award back to Elyria Catholic. “That’s pretty special for the school and the program,” Crutcher said. Kuchta said Crutcher’s contribution at Elyria Catholic went far beyond what he accomplished on the court. Crutcher has yet to decide where he will play college basketball next season but his father isn’t worried about that..